As disputes over South China Sea islands continue, the US Navy has acknowledged flying its most advanced scout aircraft over the area, from a base in the Philippines, during the first three weeks of February. Older P-3 Orion reconnaissance aircraft have flown from Philippine bases since 2012 under a bilateral agreement, according to Philippine Armed Forces spokesman Col. Restituto Padilla. This is the first time, however, that the newer P-8 Poseidon model was deployed. Developed from the Boeing 737 civilian airliner, the P-8 entered service in November 2013. 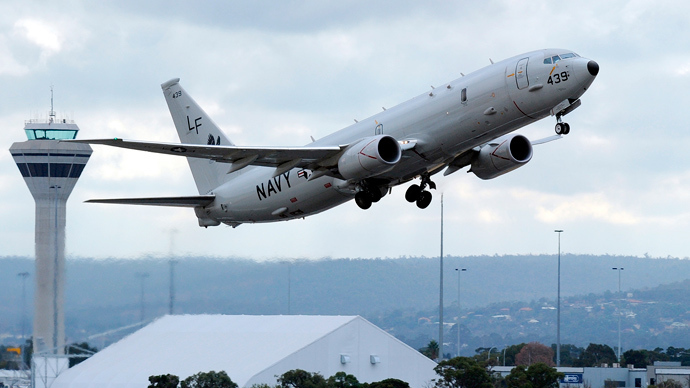 It is intended to eventually replace the P-3, in service since 1962, and is equipped with the latest sensors and electronics in the US Navy arsenal. The P-8 can even “pack a serious punch,” according to aviation analyst Tyler Rogoway. The admission comes at a time of renewed tensions over the Spratly Islands, an archipelago of islands and reefs in the South China Sea claimed by China, Malaysia, Brunei, the Philippines, and Vietnam. Earlier this week, the Philippine government announced it would not renew the work visas of 16 Chinese experts working at the national electric utility NGCP when they expire in July. China has a 40 percent stake in the NGCP. Speaking in Tokyo on February 13, following a visit to China, Deputy US Secretary of State Anthony Blinken described the conflict over the islands in terms of energy trade and control of sea lanes.